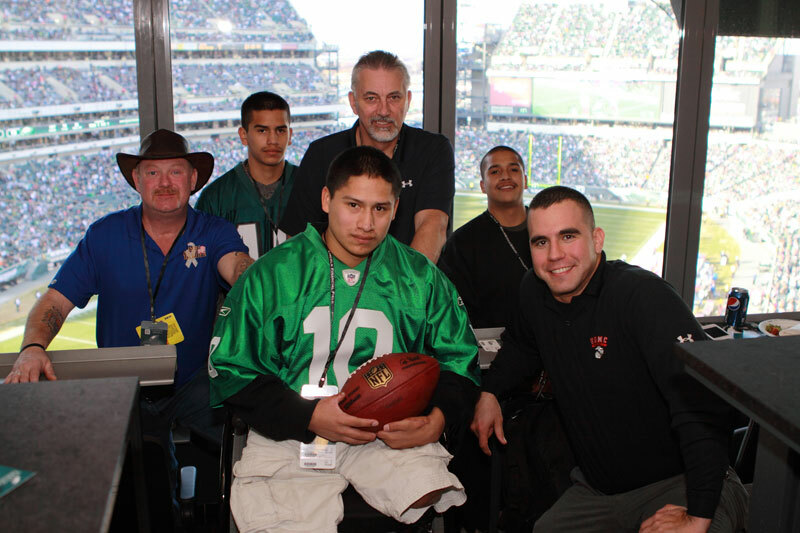 On January 1, 2012, triple amputee Lance Corporal Jorge Ortiz received the wish of a lifetime- meeting Eagles’ wide receiver, Desean Jackson. Combat photographer LCpl Ortiz (US Marine Corps) lost both of his legs and the fingers on his left hand in Afghanistan when he stepped on an IED. He submitted his wish to meet Jackson to national 501c3, WISH for OUR HEROES, which grants wishes for active duty military. W4OH contacted the Eagles and Desean granted the request, but even the Eagles did not initially understand the magnitude of this wish. Since the war in Iraq and Afghanistan began, there have been more than 48,000 troops injured. Of those 48,000 troops, the government has described 16,500 of them as ‘catastrophic’ injuries. Of those ‘catastrophic injuries’, 1,850 have been amputees. Of the amputees, there are less than 50 living triple amputees from the wars in Iraq and Afghanistan combined. LCpl Ortiz is one of them. WISH for OUR HEROES joined forces with defense contractor, Centurum, who flew LCpl Ortiz’s brothers, Francisco and Eddie Ortiz, to Philadelphia to join their brother on the trip. The sheer feet of flying is quite an undertaking for a triple amputee, but Jorge did not mind the journey, if it meant he would meet his favorite player. When Jorge and his brothers landed on December 29th, they were greeted with a limousine (provided at no cost by Any Time Limo of Fredericksburg, Virginia), which transported them to the Residence Inn and Suites in Fredericksburg, Virginia (provided by Wanda Rhyne, in honor of her late husband Deputy Rick Rhyne, whom sadly was killed in the line of duty just a week prior to their visit). There they were greeted by WISH for OUR HEROES Vice President, Bo Brister, who changed his holiday plans to personally host LCpl Ortiz and his brothers during their time out east. Brister had pizza waiting for them, and the group got acquainted and discussed the exciting plans in place for the week. The next morning, the Ortiz’s were driven (in a six passenger van provided at no cost by Stafford Toyota) to the National Museum of the Marine Corps. During a tour of the museum, LCpl Ortiz had photos taken with his brothers in front of the Combat Camera Christmas tree (decorated by Myra Giles of Centurum and Combat Camera Management). Some of Jorge’s photos from Afghanistan were mounted and displayed on easels in the reception area. He then attended a reception led by Major Thompson, Officer in Charge of Combat Camera Management, and received a photo taken and signed by the Combat Camera team currently working out of the TIPS in Afghanistan. LCpl Ortiz received the honor of cutting the cake, and guests greeted Jorge and thanked him for his service. While there, Jorge discussed his current condition with his past NCOIC (non-commissioned officer in charge), MGySgt Rhodes, who was assigned with him in Afghanistan when he stepped on the IED while he was taking pictures of a captured weapons cache in Sangin, Afghanistan. That evening, the group went to dinner and Golden Corral in Fredericksburg picked up the entire tab. On December 31st, LCpl Ortiz and his brothers were driven to Philadelphia where WISH for OUR HEROES provided accommodations for the night. On game day, the group played some catch in the parking lot and talked to some Eagles fans about what WISH for OUR HEROES and Centurum were doing for Jorge and his family. The group then met Eagles Coordinator, Holly Hubbard, who played an integral role in coordinating the experience with the Eagles. Holly took everyone down to the field to witness the warm ups of both the Eagles and the Redskins. While waiting to enter the field, the Eagles cheerleaders joined the three Ortiz brothers in a group photo, which brought a smile to all of their faces! As the warm up was concluding, an Eagles player ran up to LCpl Ortiz and handed him an official NFL football that they had been using during warm up (which was later signed by roughly 20 Eagles players). To top everything, the WISH for OUR HEROES group was escorted to an enclosed suite, fully loaded with liquid refreshments and food. Everyone watched the game, and at half time, an Eagles cheerleader came into the suite and had pictures taken with Ortiz. At the conclusion of the game, (Eagles 34- Redskins 10), everyone was escorted to a holding area outside of the locker room. As each player came by, they would stop, get a picture taken with LCpl Ortiz and sign his football. Then the highlight of the day occurred – DeSean Jackson entered the hallway, talked with Ortiz, had some photos taken, and signed his jersey (provided by the Eagles) and his football. Jorge’s smile that resulted was absolutely priceless. Upon conclusion of the signings, they were driven back to Stafford, Virginia, and the next morning they departed for San Diego, California. A perfect wish completed for one of our nation’s heroes, LCpl Ortiz. We would like to thank all of the generous people and organizations that assisted in this wish. A special thanks to the Philadelphia Eagles, Centurum, and Bo Brister for making LCpl Ortiz’s wish come true.